Light: Light is a form of energy. It helps in the sense of vision. When light falls on an object, some of the light is reflected back to our eyes. Thus, we are able to see an object because of light being reflected from the object. When light falls on a shiny surface, most of it bounces back. This phenomenon is called reflection of light. First Law of Reflection: The incident ray, the reflecting ray and normal at the point of incidence; all lie in the same plane. Second Law of Reflection: Angle of incidence is always equal to the angle of reflection. In the given figure; the angle of incidence is shown by blue colour and the angle of reflection is shown by red colour. In this figure; PQ is a plane mirror and O is an object. OA and OC are the incident rays; coming from the object. 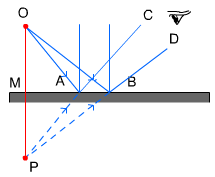 The incident rays are reflected from the mirror and reflected rays emerge as AB and CD. If AB and CD are extended behind the mirror, they appear to meet at point ‘I’. This is the point where image is formed. If OM is object distance and MI is image distance, then in plane mirror; OM = MI. This means image distance is equal to object distance in case of a plane mirror. Image is always formed behind the mirror. It is a virtual image; which means it cannot be obtained on screen. Image is upright and laterally inverted. Image size and distance are equal to object size and distance. When all the reflected rays are parallel to each other; this case of reflection is called regular reflection. Regular reflection happens from a smooth surface, e.g. a mirror. We get to see clear images when image is formed by regular reflection. When the reflected rays are not parallel to each other; this case of reflection is called irregular reflection. Irregular reflection happens from a rough surface. The laws of reflection are obeyed in this case as well but because of the irregularities in the surface, the reflected rays are not parallel. We get to see somewhat blurred images when image is formed by irregular reflection. The relative clarity of an image depends on the relative smoothness of the reflecting surface. Multiple Images: When two or more mirrors are placed at some angles to each other, we get to see multiple images. Let us take an example in which two mirrors are placed opposite to each other. If an object is placed between them, its image is formed in both the mirrors. The image in one mirror would act as an object for another mirror and this sequence would continue. This will result in the formation of multiple images. So, if the given mirrors are at a right angle to each other, 3 images will be formed. If the given mirrors are at 30° angle, we shall get 11 images. When the mirrors are kept opposite and parallel to each other, there would be infinite number of images formed.